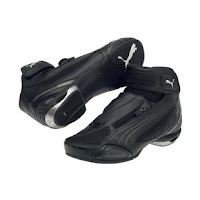 Puma Testastretta II Boots: Finally. 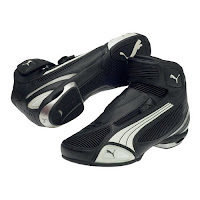 Brand new for 2010, the Puma Testastretta II Boots are impressive MotoGP-inspired riding boots that are functional on the bike and and look great off it. Puma spared absolutely no expense with these boots in terms of style, putting in detailed accents throughout. We've been waiting on the 2010 Puma Boots line since the beginning of the year. From what we see so far, it was well worth the wait. The Testastretta II has a synthetic leather upper construction, a separated MotoGP-esque aluminum heel, an injected EVA comfort midsole, and an oil-resistant non-slip rubber sole. These boots are gonna give you a moderate level of protection on the bike, but they also look pretty badass under a pair of jeans. If you don't believe me, watch the video above. If you want to compare and contrast the Testastrettas with other available options, check out our selection of motorcycle riding shoes.